The book is divided into neat sections on Light Meals and Snacks, Chicken, Meat, Fish, vegetables, lentils, bread and rice, raitas and chutneys, and drinks and desserts. I particularly like the way these recipes can be adapted in any modern Indian home, just as easily as in a Western home, with an emphasis on presentation as much on cooking. 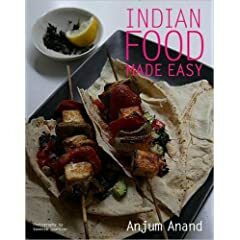 For instance, you have the succulent chicken tikka wraps, almost like pita sandwiches, in which Anjum uses cheese as one of the ingredients—though cheese is not a traditional Indian ingredient at all used in our cooking. She also uses lettuce, to line these wraps, once again which you will never find in an Indian restaurant—but a wonderful alteration alright since these have been proposed here almost as sandwhich-type mini meals. In the chicken section, I am keen to try out her Oven-fried Chilli Chicken that Anjum says are perfect and easy starters for an informal party at home—she apparently puts them in the oven when the friends are having their first drink: Marinated with Indian spices, and coated in bread crumbs, these are crispy outside and juicy inside and a recipe that is once again not at all “authentic” or traditional but an innovation that you’d like to try out regardless. Infact, the lamb section even as burgers with herbed yoghurt—using lamb kebabs and thick yoghurt instead of your conventional patty and cheese. Innovative, healthy and low cal! Pick up this book for its ideas.